Until recently, Israel was the third largest producer of foie gras (goose liver) in the world, after France and Hungary. Israelis subjected approximately 700,000 geese and 100,000 ducks to force-feeding in factory farms every year. 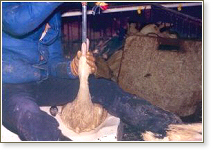 To produce foie gras, birds are restrained and a metal pipe is shoved down their throats and into their stomachs. A massive quantity of corn is pressure-driven down the pipe, often causing a rupture of the bird's stomach or esophagus, leading to a very slow and agonizing death. The force-feeding takes place as many as 4–5 times a day for a month, causing the liver to become diseased and swell from 2–3 ounces to 1–2 pounds. At that point, the goose or duck is slaughtered and the fatty, cholesterol-laden liver is removed and sold as a delicacy. In Israel, the meat of the slaughtered animal was sold as well. In addition, 700,000 geese were, and still are, are intensively farmed just for their meat. In 2000, Israel ranked sixth in world goose-meat exports (U.S. Department of Agriculture). Force-feeding is so cruel that it has been banned in Germany, Poland, Austria, Switzerland, the Scandinavian countries, the Czech Republic, the UK, and several other European countries. Only two states in the U.S. produce foie gras: New York and California. California recently banned force feeding (to take effect several years from now), and New York has a bill pending that would ban force feeding. After several years of protest by the public against this cruelty, in August 2003, the Supreme Court of Israel banned foie gras farming as it was currently practiced (which was the same method used in every country where foie gras is still produced). The Court stated that the Knesset could allow foie gras production to continue only if the Agriculture Ministry could issue regulations that "would guarantee the use of means that would substantially reduce the suffering caused to the geese." See the verdict of the Supreme Court of Israel, banning foie gras farming. In March, 2004, the Ministry of Agriculture and Rural Development asked the Knesset Education and Culture Committee to extend the current regulations for one year, to allow them time to revise them. (The Knesset Education Committee is responsible for animal laws because of the relationship between animal experimentation and university research. It has the authority to approve or disapprove regulations related to cruelty to animals.) The Committee voted against granting a full one-year extension. It stated its position that force-feeding should end completely and suggested the Ministry retrain agricultural workers who depend on force-feeding for their livelihood. At the beginning of January, 2005, the Education and Culture Committee again rejected the Agriculture Ministry's request to extend the current regulations. Instead, the Committee stated that the production of foie gras must stop by the end of January. "The time has come to put an end to the drawn-out period of many years during which the geese have suffered," declared Knesset Education Committee chairwoman Meli Polishook-Bloch. The Committee also called on the government and the Agriculture Ministry to compensate foie gras producers by the end of March, 2005, for any losses incurred. Agriculture Ministry Director-General Yosef Yishai protested the committee's decision, claiming that if Israeli production stops, other countries in Europe and the Middle East will quickly step in to fill Israel's place. He also stated, "This is the first time the Knesset has decided that an entire sector of agriculture is illegal. If we don't stop the animal-rights groups, tomorrow you won't be able to milk cows or keep chickens in coops." Those who want to continue abusive practices commonly use such justifications. In October, 2005, when it became clear he did not have majority support, Agriculture Minister Israel Katz withdrew his last appeal — a proposal to exempt waterfowl from the animal cruelty laws for three years. During this period, the Ministry would attempt to develop new techniques that would conform to the law. This withdrawal effectively brought an end, legally, to the industry in Israel. Nevertheless, Israeli farmers continued to force feed their animals. The situation in which a court ruling was not implemented for seven months is a troubling one in a state governed by the rule of law, when the state, which is responsible for safeguarding the law, is itself a partner to the failure to observe the law and judicial decisions. The outcome of this situation is problematic from the point of view of the ongoing suffering to the birds.... But beyond that, a state of affairs in which the law is disregarded by the state, is, in and of itself, deserving of harsh criticism, in view of the deviation from proper government procedures and from elementary constitutional norms inherent in the basis of the democratic process. Although some farmers in Israel continued to force feed birds into 2007, the government pressed charges against them when they were discovered. While in other Western countries the foie gras debate pits animal rights activists against farmers, in Israel there was an additional voice: the religious one. More and more religious authorities, such as Shas spiritual leader Rabbi Ovadia Yosef and Haifa Chief Rabbi She'ar Yashuv Cohen, argued that foie gras should not be considered kosher, since Judaism forbids cruelty to animals. CHAI Advisory Board Member Rabbi David Rosen, former Chief Rabbi of Ireland, Dean of the Pinchas Sapir Institute for Jewish Studies in Jerusalem, and Advisor to the Ministry of Religious Affairs, has stated that such cruel treatment of animals violates the Jewish mandate not to cause tsa'ar ba'alei hayim (the suffering of animals). "What should be obvious to any objective observer is that pâté de foie gras is completely treif (unkosher)," says Rabbi Rosen. Rosen, who has written on the topic, says that "Making goose liver involves unquestionable cruelty." Kashrut laws prohibit Jews from eating unhealthy animals or animals with defects. In the course of force-feeding, the bird's esophagus is frequently ruptured and the liver is, by definition, pathological. "This is a secondary consideration that raises questions about the kashrut of force-fed geese. Since the organs are damaged, can they be considered healthy?" says Rosen. "I can't see how any decent human being can justify eating foie gras, and I can't see how any decent Jew can justify it on halachic grounds," he says.